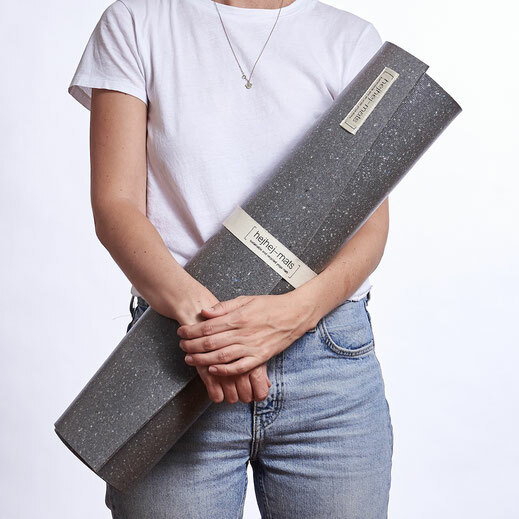 During the product development of our recycled yoga mats, a lot of prototypes and testing mats occurred. After testing some of the end of the lifecycle recycling, we still had some mats. These mats had different surfaces, consisted of different materials and some had minor traces from testings. For us, these mats were way too good to recycle. We wanted to extend the product life cycle and at the same time support a social initiative. That’s why we decided to donate the yoga mats. Why donate a yoga mat to a homeless person? Who would really need a mat? We once read an article which mentioned that blankets and a mat to sleep on are two vital things for homeless people. Since we read this article and especially with our start-up hejhej-mats, this advice stayed in our mind. So we decided to donate our yoga mats to institutions for homeless people. Once we decided to donate the yoga mats to institutions for homeless people, we recognized that this topic is not really part of our society. We don’t really think about this topic, it is not part of the conversations we have with our friends and family and we don’t really see this topic in the news and media. That’s why we want to talk to you about this topic! Who are we referring to and who seeks help at institutions for homeless people? It’s people with no home, people with drug addiction, people who quit therapy, people released from prison, people with no health insurance, people in need. All these people are not integrated into our society, they don’t have a voice. Yet, these socially marginalised groups are an extreme high amount of people. It is quite hard to get an exact amount but last year it was definitely more than half a million homeless people in Germany. Our base Nürnberg has percentage-wise the 4th greatest amount of homeless people in Germany. The institution for child and youth welfare Schlupfwinkel e.V. The two institutions for homeless people are offering medical support, places to sleep, street work, food and clothes distribution, possibility to shower and wash clothes etc. The two institutions for child and youth welfare are offering a refuge for children and youth that have severe problems at home and help them stationary and non-stationary to forget and process past traumas. How do the institutions use our donated yoga mats? The two refuges for children and youth use our mats for so valuable and social sport and gymnastics sessions. The homeless shelters will hand the mats out to homeless people living on the streets. For them, something to sleep on is really important and paper cartons are already often helpful. Sport/camping or yoga mats are a great help for people living on the streets. For us, the conversations with these shelters were really informative since we mostly don’t know how these institutions really work. We want to share with you a common procedure people are experiencing when coming to such an initiative. People decide to come to the shelter by themselves or street workers suggest them to go there. The first step is often to enable them to take a shower and get new clothes. People can then use the service of a doctor working there and can get food. They get informed about the places they can sleep, some are just for up to three days, a lot of others are permanent and people can stay there. People who are staying on the streets can take out stuff they really need. Here the initiatives often hand out mats in combination with blankets or sleeping bags. What most homeless people living on the streets name as the worst and most hurtful behaviour is to look away. So many people are passing without looking or even turning and facing away. Homeless people are part of our society and have the same needs we have. Social interaction is so important, especially, when living by yourself outside. Small talk conversations make people happy and a simple “How are you?, How was your day?” can be valuable. It is great to start longer conversations and you can then ask if the person really needs something. Maybe you can then give her/him some money, buy her/him what’s needed or tell them from the different social institutions for homeless people. There are so many great initiatives in all bigger cities in Germany. Often they even have one simple plan where you can find all the different institutions in the city. Support with financial/material donations or volunteer work. Most of the initiatives are dependent on donations. If you want to do a small financial donation, you can be sure that your money is used in a good way. Material donations are really important when it comes to the topic of food, clothes, and other needed things. For clothes, it is really important that the condition is still good. Shoes, socks, and underwear are the three things the initiatives told us that are often needed most - still always ask if they need your donation. What you can do with your old yoga mat? Donate your yoga mat as well to a local and social initiative for homeless people. Most of the institutions for homeless people are really in need of mats so just briefly ask and then grab your old mat and donate your yoga mat.